The black arrow points to a Mesonet station just a couple of miles from our house. As you can see, we got a lot of rain, but didn’t have the worst of it. 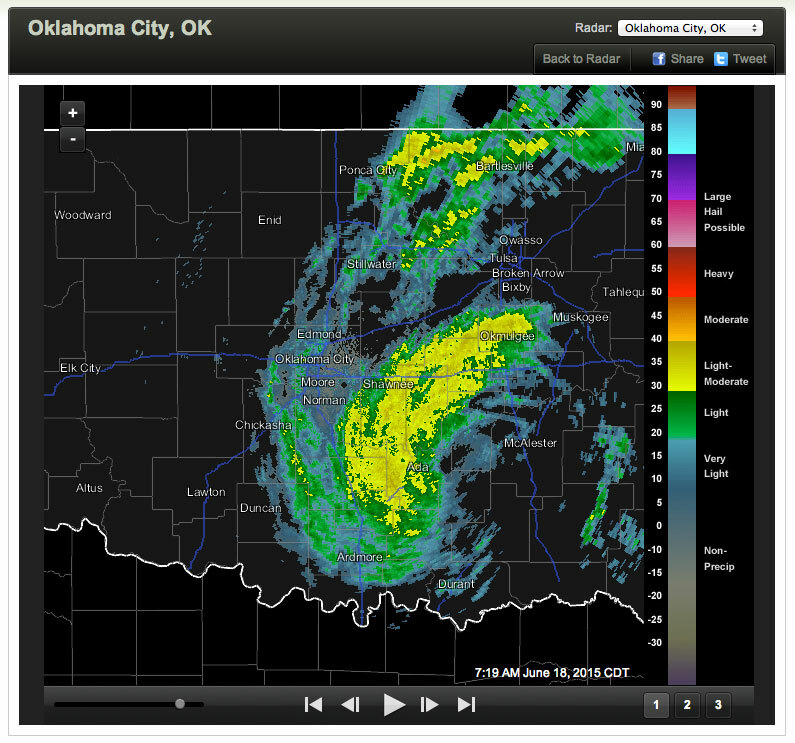 Mesonet radar shows a classic tropical storm shape of precipitation centered almost directly over us this morning. I am accustomed to talking about my sister’s annual dealings with hurricanes and tropical storms in New Orleans, but the last couple of days have been Oklahoma’s turn at the center of that storm: in this case, Tropical Storm Bill. Due to a storm track that took it right over us and a phenomena known as “brown ocean effect,” we’ve been in the bullseye this week, at times forecast to receive 6 to 9 inches of rainfall. It’s all slated to move out today, but that will leave behind crushing humidity. 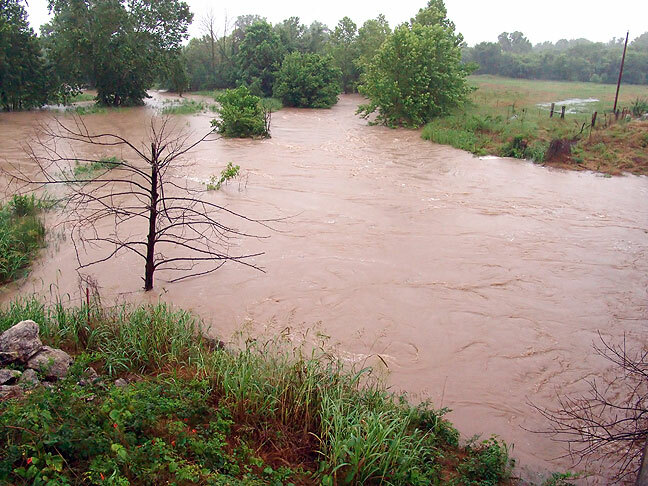 I made this image of Little Sandy Creek, between Byng and Ada, flowing well out of its banks, on my way to work this morning. 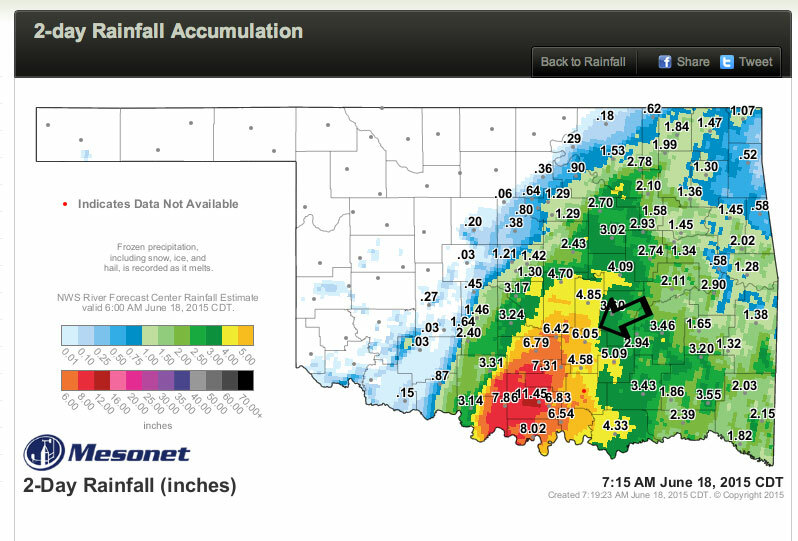 As one of my 70-something-year-old aunts posted on Facebook recently: “2015: the year it rained in Oklahoma”. Here in Central Texas, we’re far ahead of our average (and already have as much rain as we got in all of 2014), but we’re certainly behind you Oklahomans. Every time I get two inches, my parents get four. When we had 11 inches in a month, they had 20. As McDonald’s would say: I’m lovin’ it. I love having a plush green lawn without watering. I love not being on our 25th 100-degree day of the year (zero so far). I love walking outside without immediately sunburning. I love the beautiful cloud formations and resulting fiery sunsets that only storms can bring. Plus, I just love the rain. The slugs come next. Be warned.